Update: In honor of my late mom, Kaija Robinson we created Black Cat Awareness Day to be held on her birthday, October 27. On Friday we celebrated National Black Cat Day with sad update about my mom. It was her birthday and given that she was in palliative care, I said it would be her last birthday. Little did I know how prescient it would be. It was a day with much to celebrate. My book hit #1 on Amazon in one category. One of our dear contributors the amazing VanCatMeow from Australia shared a sweet post. Cole and Marmalade our most famous contributors shared posts about our book across Facebook, Twitter and Instagram.to more buzz than we could hope for. Still scrambling to catch up on email, book promotion and a million other details, the social worker from the hospital I’d spoken with twice including that morning, called again later that day. “Your mother passed peacefully.” Best day. Worst day. Birthday. I went on auto-pilot and did what I needed to do for work. Cried. Called my brother who I’m estranged from. Cried. My head hasn’t stopped spinning since. My mother had a flair for drama and I had to laugh. Of course, she would go on her birthday at the most inconvenient time. It’s just the way she was. After all, I had told her hours earlier that I loved her and to let go whenever she was ready. She had a love/hate relationship with birthdays. By mid-October she’d be in sulk. Never wanting to grow another year older but wanting a party and presents. The only thing she wanted in the past three years was another kitten after Miki died but she didn’t get her wish. I considered all the options, fostering, maybe a pocket pet but she was no longer able to care for a pet. 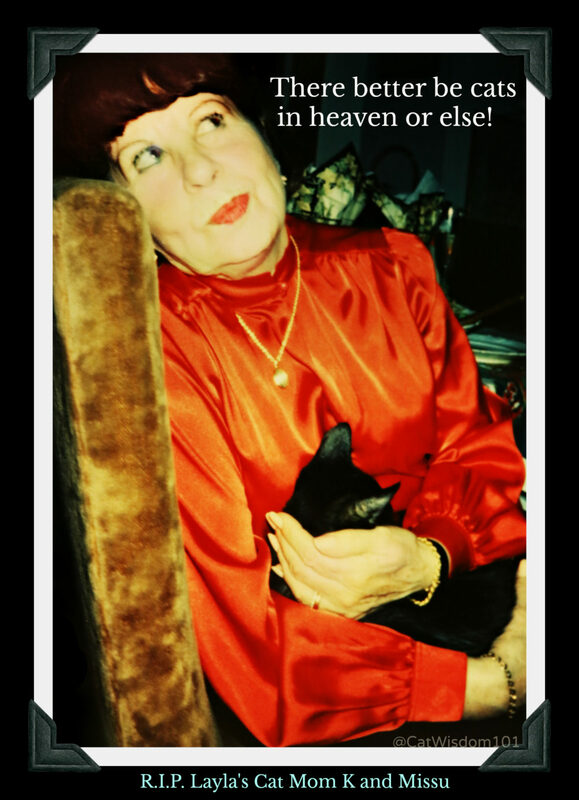 It’s fitting to celebrate another cat holiday, National Cat Day in memory of my mom, who adored cats. This one’s for you, mom but you’ll have to share the limelight with Odin. 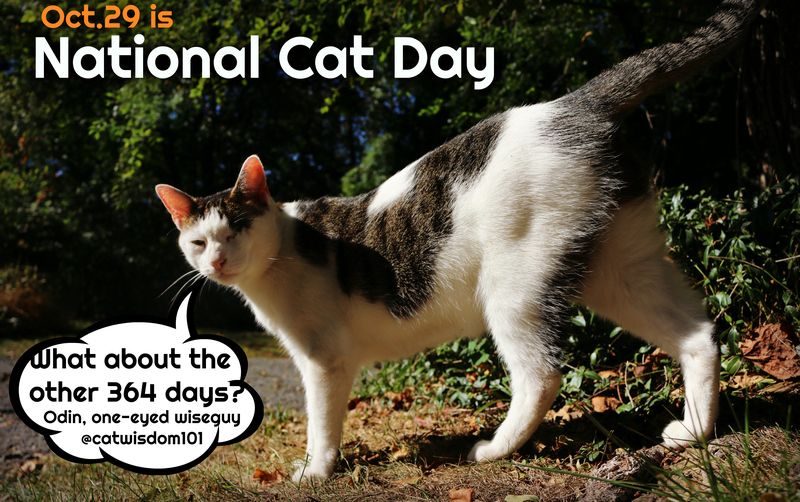 The link opens to National Cat Day in 2014 when we celebrated Odin’s Gotcha Day. Today we celebrate Odin’s 7th Gotcha Day not that he cares. He was strutting proudly earlier in the week after killing a plump mouse. Mom often smiled like a Cheshire cat. I can’t remember her ever not wearing lipstick and her signature green eyeliner. She always looked glamorous and ridiculously young. A true Scorpio, she loved red. This was her last kitten, Missu who lived to a ripe old age but not as old as mom. She was notoriously vain and would have loved this post. I can imagine her griping, in her Nordic accent, “Why didn’t you do this sooner? Can’t you do something with my hair, darling? 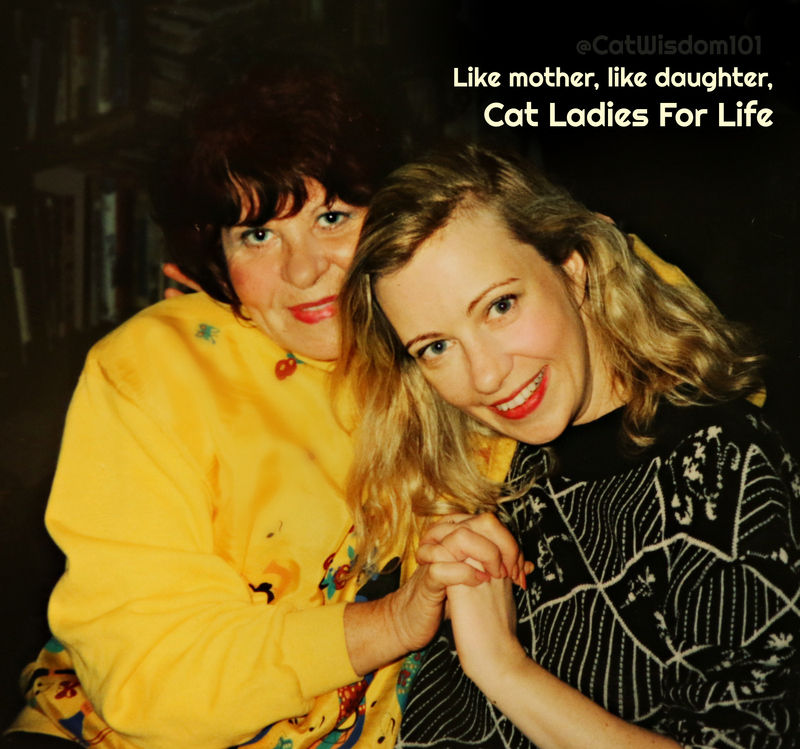 Like mother, like daughter, we were always cat ladies. Like all relationships, there were ups and downs but insisted I was her favorite, her golden child most of the time. This was taken about 20 years ago and feels like yesterday. I feel blessed to be the keeper of our family albums and boxes galore of family photos. As soon as I found out mom was in ICU last week I pulled out all the albums and picked some favorites, knowing I’d be sharing them some day but not so soon. During my childhood, after immigrating to Montreal from Helsinki, she called herself Kaya or Kay. My boyfriends called her Mrs. K but in later years she used Kaija and the more recently her middle name, Kersti. It was always weird having the hospital call about Kersti and I’d go, “Who?” She was in the hospital a lot after a fall three years ago. I brought her to a chiropractor that I’m convinced would have kept her mobile, but she refused to keep up the protocol and destiny landed her a wheelchair. It marked the beginning of the end of the mother I knew. She could not indentify being handicapped in any way and became reclusive. The vivacious glamour girl did not want someone looking at her with pity. My attempts to rationalize like: millions of people survive and thrive in wheelchairs. They travel, work, do everything abled persons do. Not even mentioning Elizabeth Taylor looking glamourous in wheelchair worked. A two-time widow with men aways vying for her attention, ended once she was wheelchair bound. Mom had loved to travel, try new things, read the newspaper and stayed current with news, until senility made its gentle creep. She managed to stay home for three years until she fired all her caregivers. It was time for an assisted living facility. During another hospital day, my brother moved her belongings out, she arrived at her gorgeous private apartment with the best possible care. She called the assisted living facility, death’s waiting room. The chronic pain she experienced wore her down. I’d called my mother anywhere from daily to weekly during my entire adult life and in the last year more frequently. I found my mother was fading, shrinking into another person I didn’t recognize. Every day I felt closer to becoming an orphan. The only thing she never failed to mention was the pain in her feet. Every. Single. Time. My feet don’t work. Sometimes, she wouldn’t recognize me and accuse me of some pretty outlandish things but it was the dementia-induced paranoia talking. One of the last times we spoke, she was lucid, in good humor and did not mention her feet. She is now free to dance with all her beloved kitties, my father, friends, and relatives. The last of my aunts, who my mom adored died this summer so it’ll be a party. My mom loved nature and all animals and they seemed to like her. Fly free. There will be cremation and no funeral at her request. I wish I could sleep like the dead and I’m trying do as much self-care as possible to avoid joining mom pre-maturely. What will happen next? Who knows but Clyde and the rest of the gang are doing a Halloween post tomorrow. See you soon and give your cats more loving today. And call your mom if you can. I am sorry for the late reply to this post. I am so sorry for the loss of your Mother. I send my thoughts, condolences and prayers. I was so very sorry to read about your Mom. I had to wait until now to write and express my condolences as it brought back so many wonderful and poignant memories of my mother and of her passing. With this, an upwelling of grief. Your Mother is an element of yourself and will continue to be there with her love, wisdom and her words will continue resonate through your being. I pulled a card for you and got the Queen of Wands! She with the black cat! I did not read ahead, so this blog posting was not what I expected…nevfurtheless, how appawpriate to wait till a special day to leave the earthly form of her body. I once looked after a lady who was so looking forward to Christmas…and when all her company had gone home, and I had tucked her into her bed, when I checked on her about an hour later she had gone to other worlds. What a wonderful mother you had, and such special memories to keep close in your heart. Sending many hugs and keeping you close in my thoughts. I am so sorry to read about the loss of your mom. I’m sending comforting purrz. TW said your mom reminded her of her mom with the bright lipstick and always on the go. we are so very sorry about your Mom. Losing someone you love is so hard. I think the dementia makes it even harder because you have to struggle to not take things as a personal assault . You know it is happening but the first few instances of the person that you know and love being “different” is very hard to take. We send you our love and purrs and prayers and we think that your Mom was one wonderful cat lady fur sure! So sorry for the loss of your mom. She sounds like she was a wonderful person. Charles, thank you for your kind condolence. My deepest condolences to you. Hang in there. My condolences on the passing of your mother. You were a part of her, and she a part of you, so you’ll never really be separated. Hugs and purrs. 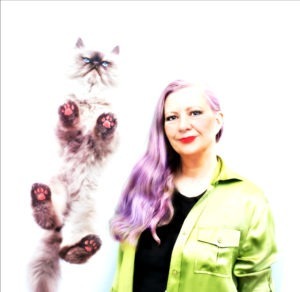 Merci mes amies xox Forever cat ladies, yes! Please accept our deepest condolences, Layla. Your mom sounds like she was an amazing lady, and your evocative and loving tribute to her is beautiful. Peace and love to you. My deepest condolences Layla. To love and be loved is the goal of life, your Mom had that in spades. She was lovely, and now she dances with others she loved. Your tribute to her was beautiful, it is like we go to ‘meet’ her, thank you so much. Happy gotcha day Odin, the other 364 days of the year are bonus ones. I’m so sorry for your loss. Your mother was such a strong and powerful personality… do take as much time as you need to nurture yourself. I’m sending lots of purrs your way, and I hope you are getting great purr therapy from your own kitties. So sorry for your loss. Your mom sounds like a really interesting person. My mom is in a nursing home now. She usually ends up in the hospital every winter with pneumonia and each time is worse so I’m not looking forward to this winter. Please take care of yourself. Thank so much Andrea. There is a new pneumonia shot for seniors. As you know pneumonia is can be fatal with seniors so any prevention is worth looking into. I need a flu shot soon. I forgot last year and got pneumonia last winter. We are sorry for the loss of your Mom and send our best and biggest paw hugs to you at this desperate sad time. It is never easy to say goodbye to one’s mother. I lost my angel mother when I was 29, and I will always be grateful that she understood that I couldn’t survive without an animal presence in my life. It sounds like your mother was like this, and I have never understood why assisted living facilities and senior residences don’t have animal residences attached to them. Animals are essential for our sense of connection to the world, and caring for a beloved pet is the thing that has enabled me to live a sane, more calm life. Without a cat, I don’t hear the world purring. It sounds like your life is filled with highs and lows, but love surrounds you. You are a shining light to so many, and I’m sure your mother was filled with joy just looking at your radiant goodness. Can’t wait to read your book and remember all the black cats I have known and loved….Smokey, Little Orphan Annie, Mr. Boy. Thanks so much for your thoughtful words. Agreed about how pets in assisted living would be so helpful. Some place are offering that option but not enough. Laura, thank you for your kindness. I’ve been communicating with her but it didn’t occur to me that she’d read the post. She’ll probably want me to do some edits! Thank for your kind words and understanding. Living with a parent in cognitive decline is losing them before we lose them and you did it for 20 years. Her legacy is my legacy and I hope the cat world will be better for it. Deb, thanks for stopping by with your kind words. I missed all your latest events and barely on fb but hope we catch up soon. I am sorry for your loss. Happy Gotcha Day to Odin. Sue, thanks kindly. It much appreciated and Odin says thank you. What a loving tribute to your mom, Miss Layla. We’re sorry for your loss…and send you many comforting purrs. A beautiful tribute to your lovely mom. Oh Layla, such love and grief. Pouring like rain from your post. You resemble You your mother a lot in the photos you’ve shared. A mother is… irreplaceable. A mother is our first and our always love. Your mom had such a loving, giving spirit, and your spirit is the same. <3 <3 <3 Thank you, Layla, for this most giving post — giving, or lending, your mother to us for a few moments, which brightens our day and will enrich our lives forever. I am sorry for the loss of your mother, Layla. This is a beautiful tribute to a beautiful lady. Sending you love. I am so sorry. 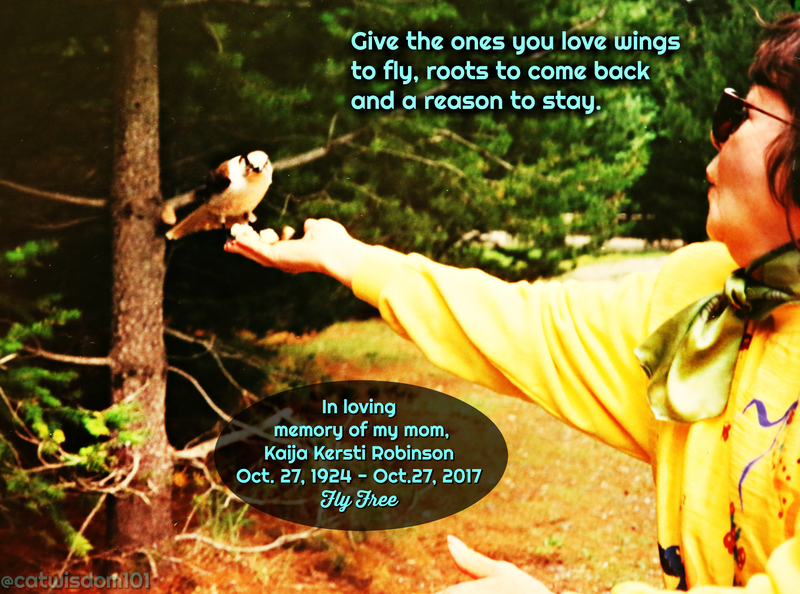 You have written a beautiful tribute to her life. Sending you love. So sad about your loss Layla……….the road you and your Mom traveled sounds much like the one I had with my Mom although she had Alzheimers her last several years and was in a nursing home. We had ups and downs but there was one brief period when we were closer than close – more like buddies – and I like to remember her like that. She also did not want a funeral so we followed her wishes. Your Mother sounds like she was a lovely woman beyond the physical although she certainly was beautiful in that respect just as you are. In coming days (and when she has time!) she’ll visit to let you know she is fine now. They are always there……always. Sending you a hug…………. I’m so sorry for your loss, Layla. May peace and comfort find you at this sad time. Angus sends his love and purrs, too. I’m so glad you had such a full relationship with your mother and that she had such a long life lived on her terms until just a very short time at the end. Losing your mother is a milestone, a point of change, and perhaps it will make a change in your health as well as you let her earthly existence go. My sympathies. Layla I am deeply sorry about the loss of your Mom, it’s only been a little over 3 months since my Dad died, and although I can’t say I know your pain, I do understand. Your Mom sounded like a wonderful spirit and she was a true beauty, which she shared with you. I know words are of little comfort now, and to be truthful, I’m at a loss myself to say many of them because my heart is shattered and I’m trying to understand it all, well maybe understand isn’t the right word, but come to terms with it. Like losing my Abby, I think this will be a long process. Be gentle with yourself and I will keep you in my prayers. What a beautiful post about your mother. I’m so sorry for your loss. The line, “my mother was fading, shrinking into another person I didn’t recognize” really resonates with me, as my own mother is doing the same now. It’s painful to watch …for all kinds of reasons. Sending you live and peace.